Your Daily Cute: Happy Ending: I Found a Lost Cat After 3 Weeks! I haven't even written it yet and this is already one of my favorite posts ever, right up there with the day I announced that Little Meow got a forever home. I've kept kind of quiet about it here (hoping to post about a happy ending), but some of you know from Facebook and Twitter that I've been searching for a lost cat for the past few weeks. NOT Pimp or Moo, thank goodness, but Stubbie, a cat I was rescuing from my office parking lot. Stubbie is a sweet little thing with no tail. She had a tail, but when she was dumped in our parking lot she had a rubber band around it and it eventually lost circulation and was no more. She is an absolute love who deserves better than the parking lot life. So her other two parking lot mommies and I decided to look for a home or rescue for her. Her main parking lot mom, Kelly, found her a tiny rescue where she was welcome to go (even after she tested FIV+!) and we were happy to give her the beginnings of the good life. However, on her first night there, she somehow managed to get out. Stubbie is shy and she was no doubt scared. We have no idea how she got out, but I woke up the next morning to an email that started with "OMG! OMG! OMG! I don't know where Stubbie is." Panic. I drove over there, speeding the whole way, hoping to find her in the deep back of a closet or something. But no, she must have gone outside. And so started the search. I was NOT letting this girl be on her own in a place she didn't know. Our goal was to do better for her, not to just dump her somewhere else. Luckily, the neighborhood was very cat-friendly and safe, and we weren't immediately concerned about strange streets or traffic. The short version of the search: Over the past three weeks, six of us have spent probably a couple hundred hours scouring the neighborhood; we've hung and passed out over $350 in color fliers, signs and stickers; we've put out countless piles of food hoping to just give her a place to stop roaming and make a "home base;" we've talking to every neighbor within earshot. 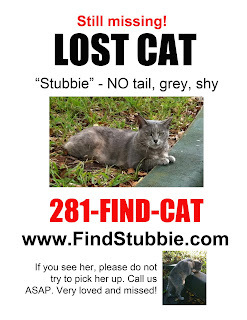 I made Stubbie her own website -- www.findstubbie.com -- and posted it on all the fliers so people could get the latest updates, sightings, contact info and her story. We registered a special phone number for her with Google Voice so she could be an easy-to-remember 281-FIND-CAT. 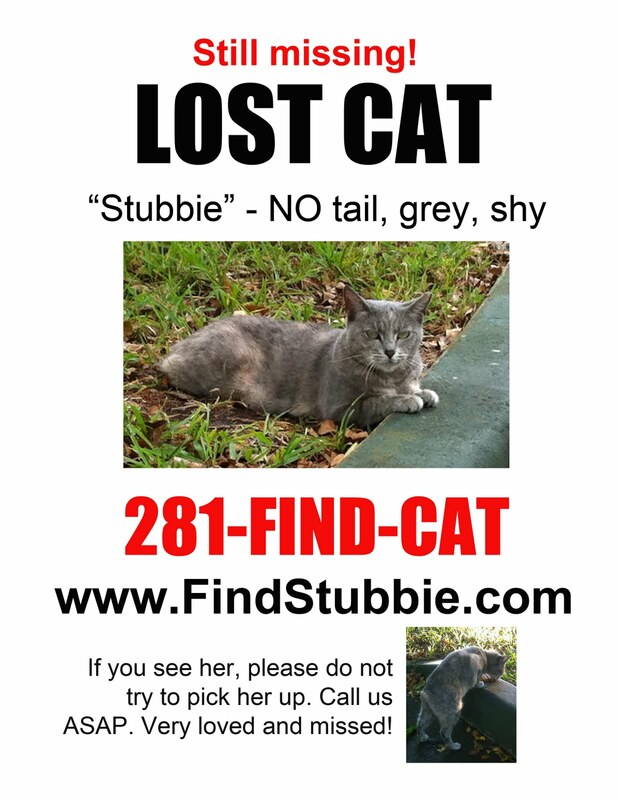 I made "Stubbie Search" a foursquare check-in with contact info and her picture. We were getting some calls from people all over the neighborhood. 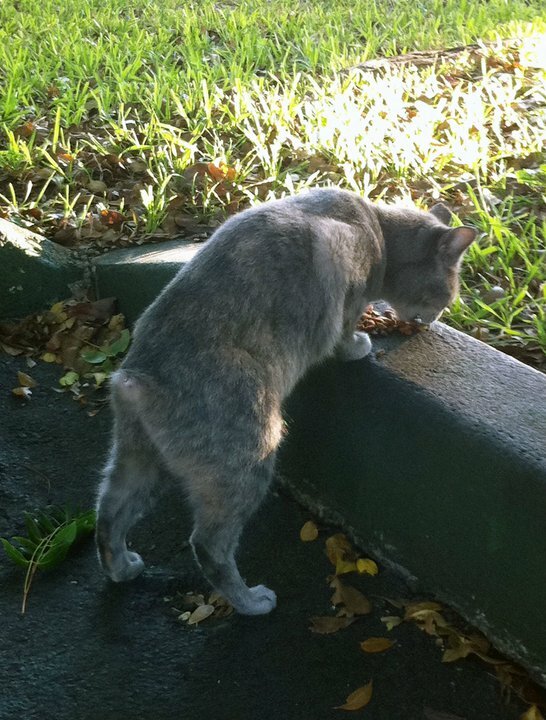 They saw a gray cat, but weren't sure if she had a tail. They saw her 100%... the morning before. They saw her walking across their front yard. I sped over every time, but none of us ever saw her ourselves, and we weren't even sure it was her they were seeing. After nearly two weeks had passed, I'd honestly all but given up hope. I wasn't giving up, believe me, but that little seed of doubt was creeping into my head and I was worried we'd really never find her. And then, like some kind of miracle, Kelly, one of her fellow parking lot mommies SAW HER when she was going to put out food! She was walking across from the house she'd gotten lost from. STUBBIE! She fed her, but Stubbie wouldn't let her close enough to touch. She stayed with her a long time, but there was no getting her that night. We knew where she was, though! Progress. Over the next week, we visited those bushes and Stubbie several times a day to make sure she always had food and water, and no reason to roam. She slowly got back into a routine, learned that we were the people who loved her and eventually started coming out more and closer to us. Today, finally, WE GOT HER! Just wow. Our little girl is safe. I am so relieved and so happy that we were able to find and get her. You can't even imagine. Lost cats just don't normally get found... Stubbie is very, very lucky. Here's a video of her in my office right after Kelly scooped her up and into a carrier. She came to hang out with me for a little bit before she went to her next destination. Today she's in our friend's bathroom and she will go to the vet next week to get a bad tooth fixed (we took her to the vet before the rescue) and then we'll figure out what the next steps are. Part of me wants to let her live in her parking lot again, where she's lived for years with her fellow parking lot kitty friends. She gets food from us three times a day, lots of love and vet care when she needs it. It's not that bad of a life. And the other part of me wants to try desperately to find her a real home, with a forever family who will love her and give her the adjustment time she needs to be a good inside kitty -- which I know she will be! But in the meantime... back to the parking lot while we look? I'd hate to coop her up in someone's bathroom while we search. Finding an FIV+ kitty from a parking lot a home isn't the easiest mission to embark on. Whatever we decide (we have a few days to figure it out), I know we'll do what's best for her. I love that little girl. And having her back safe and sound and with us is the best thing that's happened to me in many, many weeks. And just for the record, the rescue she went to, Good Karma Pet Rescue, is a great place. The woman who runs it is fabulous and cares immensely for all the animals there. She has a huge heart, and this was something no one could have predicted or ever thought would happen. 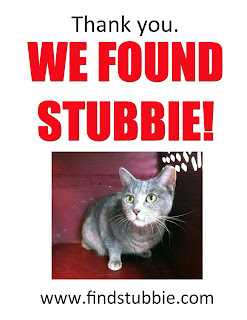 She helped hugely in the Stubbie Search and we love her for offering Stubbie a place to live. She may go back there; she may not. What I've learned for all of this, I think, is that sometimes OK really is OK. And Stubbie's life in the parking lot really is kind of OK.
Oh we love happy endings. Now just to find her a permanent home. . I'm so happy for you and Stubbie! She's a dear and very lucky to have people that love her so much. I can see it in her eyes when she's being pet- she WILL make a great indoor kitty someday. Hooray! I am so glad you found Stubbie. She looks so sweet. What a wonderful story! I'm so glad you found Stubbie, and I hope she finds a forever home. That made my whiskers grin up beyond belief, hooray, hooray, hooray! Yes, she needs a home fur sure! HOORAY! I'm sooo glad you found her! What a nice girl. I hope she gets a good home soon. Yeaaaaaa! so glad you found him. I was worried. I'm glad you found her. As for where for her to live...you are in a warm climate, the parking lot is familiar to her, you provide food. As you said - it's not awful. I would only be concerned with a hurricane or the like and what then. That is so exciting that you found here. We sure hope you can find a home for her. It probably wouldn't hurt for her to go back in the parking lot though. I just hate to think of her getting run over. I had a cat disappear and came back after three months. I nearly fainted over that one. She now lives in the house since she has a bad heart. Keep us posted about Stubbie. Take care. Thanks for working so hard to get her back. You have bought tears of joy to my eyes! I am so happy for you and Stubbie. What a pretty girl she is, I love her once-was-a-tail, please give her a hug and a kiss from us here in Melbourne Australia. Such a wonderful and heartwarming story!!! What a fantastic result, indeed a lucky, lucky little cat to have found a place in human hearts who cared enough to mount the epic search and rescue that you mounted.I love the video, yes I agree she will make a good house cat, she is clearly friendly and responsive, perhaps she just needs access to the outside as well. (Like my little cat who is in and out of his little cat door to suit himself, but knows where he lives and who cares for him with out a doubt.) Yes it needs a little thinking through, because if a cat has had an out door life, basically feral, they may not actualy like being kept inside. Before my current boy, who just turned up on his own as a stray over a year ago remaining unclaimed I adopted him, ... no he adopted me, and moved in, but it is completely on his own terms of freedom. Well before him, I had a rescued feral cat recovering from a broken nose and leg, this was a approx 2 year old who had only ever loved a wild life, he had not been neutered, first job, had some sort of digestion problem and terrible skin condition that needed sorting out, again he loved his freedom and was a prolific hunter despite being well fed, when Hobo was brought to me he was not friendly or used to human contact or handling, he would come and go on his own terms, occassionally dragging his pray through the cat flap to eat in the kitchen! uggh... some feral habits die hard.But with time and patience he turned into a prince, a once in a life time cat - if any one needs inspiration to adopt a feral cat please read his story. Meanwhile I leave you with massive congratulations on what you do! If their is a nomination form some where with St Francis I will put your name on it... sure as anything he is looking over you and smiling in gratitude at your work with the parking lot cats. MY FAVOURITE POST TOO! I have shared your lovely rescue story of Stubbie on my Polydactyl Cat Page, there is always hope for every cat, whether it has a tail or just a tale to tell ... whether it has something unusal like extra toes and sometimes funny looking feet - with a little and sometimes a lot of help from their two legged friends, there is always hope for a better life. What a beautiful story about your Hobo. I just read the note on your Facebook page. I'm so sorry for your loss of such a wonderful kitty, but so happy that he found you and that you could help him become so perfect! How great that you two had each other. :) Kitties are the best, aren't they? And sometimes they just surprise us. Thank you for sharing his story with us! Thank you! :) And what a sweet picture! Is that Hobo? Thanks, Luna. We'll do our best to make sure nothing ever does! I will definitely keep you posted, Marg. Three months? Wow! You must have been so happy! We've been pretty lucky with that in the past few years and haven't had any major ones around here. It's always a concern, though. I have no idea what we'd do with all these kitties if a hurricane came. I can imagine my crazy self would be out there trying to trap them all and stuff them in a bedroom for a few days... Haaaaa! Me, too. I think I'll have to go on some kind of all-out campaign for it. I have pawned a cat off on almost everyone I know who was even remotely willing so far... Heh. I'm running out of potential mommies and daddies! It is the hugest weight lifted off my shoulders. Stubbie is all I have thought and worried about for the past few weeks! I hope we find her the BEST home, too. She really deserves it. I know she will, too. She really is just so sweet and pretty. Now we just have to find her the right indoor home to go to! She is so pretty!!! I am so glad you found her!! Awww...she IS a pretty girl, and what gorgeous green eyes!! !